It’s dark, you’re offshore, your partner is busy setting up rigs and is almost ready to drop em in the water, and you find yourself really needing to answer the call of nature. So, you decide a quick run to the john is in order and head for the cabin door. Of course, since you’ll be out all night and trying not to run the engines for hours on end just to keep the batteries topped off, you only have a couple rear deck lights turned on so you can see without running hooks through your thumbs. Heading for the cabin you feel your way to the door, smack your forehead on the overhang, then bang your knee on the door latch before finally finding the light switch. Annoyed and a little lumpier than a moment ago, you finally make it to the john with a slight limp and yet another vow to do something about that dark entryway. How about that time you had to hunch over the engine with a flashlight clenched between your teeth for twenty minutes? Wasn’t that a hoot? For sheer enjoyment and thrill seeking though, little beats climbing thirty feet up to replace a masthead light. There’s just nothing quite like being thirty feet in the air and clutching an aluminum pole for dear life while riding out the wake from a careless boater. When you think about it, there really is a lot more to be said about upgrading the lighting on your boat besides how great it is to draw less amperage. There is more than a little allure to having lights that not only improve efficiency and reduce fuel costs, but just make being out on the water a whole heck of a lot more enjoyable. We hear a lot today about how great LEDs are. They use very little energy, they’re the lighting of the future, they’ll make the incandescent light bulb obsolete, and every one of these claims is in fact true. However, we don’t hear nearly as much about the other everyday ways that LEDs can benefit us, and considering that these benefits are quite considerable, this is something of a shame. After all, while a new LED light fixture will cost you more than a regular incandescent setup, will that incandescent still be burning five, seven, or ten years down the road? How about commercial lighting? Does anyone really like the red tinted light of the big department store parking lots? Even better, how about all that light we project up into the sky every night because we can’t seem to develop a light bulb that puts the light where it needs to be, and so we blot out the stars in our skylines and drain our expense accounts with producing light that illuminates nothing but birds and clouds. Seems somewhat silly that we can rebuild a hip or send probes to Mars, but it's taken us over 100 years to develop lights that actually put light only where it's needed does'nt it? Let’s face it, incandescent light bulbs were never about producing light properly. Electricity was cheap, convenience was the order of the day, and there was little incentive to develop anything better once we had a light bulb that could work in every citizens home. One only needs to look at how very little the incandescent bulb has changed in over 100 years of use to see the proof. Today, however, electricity is not so cheap, and quality illumination has been recognized as the key player in work productivity and everyday safety that it really is. Boaters are perhaps one of the first groups to really understand this better than anyone. After all, if you are responsible for not only using and paying for electricity, but generating it as well the way boaters are, you are certainly going to have a somewhat deeper and more acute grasp of just how important lighting efficiency and quality really is. As any boater can attest, lights are power hungry parasites on any electrical system. Just about anyone who has owned a boat is intimately familiar with working in the dark and making due with inadequate lighting, simply because it is too expensive to run powerful lighting for lengthy periods. Unfortunately, they are also likely familiar with the seasonal expense of replacing these seldom used lights, as well as the accidents and mistakes that come from trying to make do with poor lighting in the first place. While it might be easy to laugh about climbing the mast to replace a light, it’s not so funny while you’re up there doing it, and even less funny if you’re one of the unfortunates whose luck ran out and ended up in a hospital bed. Is it any wonder then that LEDs have taken the boating industry by storm? Look on any internet discussion board dealing with boating and there is guaranteed to be at least several topics on LED lighting. 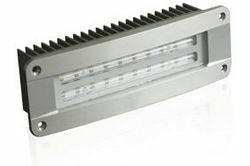 If sales indicators are any clue, LEDs are fast taking over and distributors are adding new LED offerings to their lines of LED fixtures almost daily. There is little doubt, at least within the boating community, that LEDs are indeed the lighting of the future. Considered practically, LEDs just plain make sense. If you would like to illuminate walkways, stairs, railings, engine rooms and other areas on your boat where safety is a high priority, you simply cannot beat LEDs for effectiveness. A simple LED courtesy light like Magnaights’ LEDFM90 flush mount LED down light mounted in any of these areas for example, provides enough illumination to see quite well by, yet pulls less than 3/4 an amp of power, and will run for up to ten years without replacement. You can even install several of these lights, run them all night, and still have even power to start the engines without a problem in the morning. Try getting that kind of performance from a halogen lamp. How about putting an LED equipped mast light in place next time you have to make the trip up the mast? Imagine cutting your power consumption and not having to make another trip up the pole for several years; sounds like an attractive scenario doesn’t it? Next time you’re considering replacing a few lights on your boat, take a moment to think about all the times you cracked your noggin or a shin in the dark. Think about how much fun it is pulling apart corroded fixtures to change a light bulb. Remember how much fun it was replacing a masthead light in light swells, in the blazing heat, with little more than a hard deck to cushion your fall if you slipped. As we’ve noted, it’s no wonder LEDs are so popular with boaters, is it?